Mod: More randomly-generated trees dot the landscape. (2) 2,000 more tree objects purposely placed manually via the \VISUAL\MAP\SECTORS\OBSECDEF.INC file, bringing the total number of manually placed objects (trees, buildingsm runaway, and others) to 12,000. 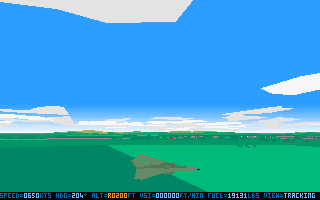 Stock game has approxiately 10,000 objects in the landscape. Flying low-level. The modded FLIGHT.EXE is on the right. Again, more trees are randomly generated in the right window. The trees are poorly contrasted against the green day-time landscape, but trust me, the randomly generated trees are there! You can pick them out with the naked eye. Lack of memory resources prevent me saturating the landscape with more trees. Definitely more trees generated on the landscape than the stock game. SoundBlaster driver loaded. No memory problems. BTW, If you take your Tornado high up, let's say up to Angels 20 (20,000 feet), and switch to TIALD view, you will see the entire landscape dotted with tree clusters (copses). See below. Tornado modded to add more tree copses (clusters) to the green European landscape. The mod adds about 300% more trees. 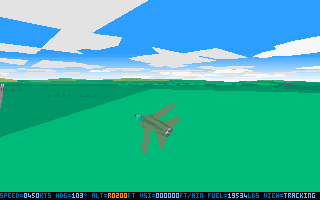 Tornado's 3D engine, FLIGHT.EXE, was written in 16 bit assembly language and runs within the 640Kb conventional memory. This places severe limitations on adding more trees. For example, it is impossible to add even more trees, in the hope of saturating the landscape with dense carpet of trees. 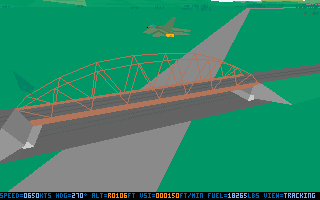 In the process, you will find that the linking process of FLIGHT.EXE will fail due to insufficient data segment space, trees will be found on airfields, and in the Tracking View (F1 key), the Tornado tends to flicker on and off, thus ruining the gameplay of this classic flight simulator. Therefore this video represents the most I can do to add more trees to the fleeting landscape. It is my hope that someday someone else more clever than I will find a way to add even more trees on the landscape. Until that wonderous and amazing day, enjoy my mod! Visibly more trees now pepper the rushing landscape. See lower half of the video. 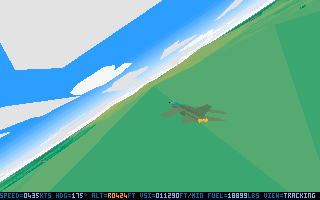 More than the original but less than what I hoped the 3D engine could be reprogrammed to do! The is only so much the 25-year old source code can be made to jump though hoops. P.S., technical stuff. Software I used were DOSBox, ffmpeg and OBS. Mod: More clouds in the sky. Description: Enjoy yet another Easter weekend Tornado mod! I noticed that the stock Tornado was lacking quite a lot in the cloud department. So I decided to do something about it. Below are the before and after images. ...and after Cloud mod. More clouds than you can shake a stick at now. Why have more clouds? Why not, since computers of 2018 running DosBox can handle more polygons compared to the 1993 ancestor PCs? So here it is! Digital Integration's Tornado with tons more clouds - in two layers. As voluminous as the 1993 source code could make it out to be .... or not. 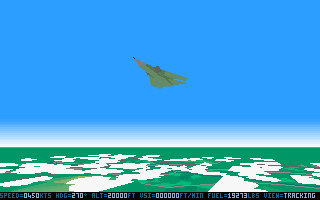 Still, the original 1993 Tornado only offered a smattering of clouds here and there to keep the frame rates of the day acceptable on 386 and 486 PCs. More clouds than the original. Something mesmerizing just watching the clouds drift by. In this mod, I have given the lower layer (light gray clouds), a 30% chance of forming clouds. The upper layer (white clouds) have a 50% chance of forming clouds. This cloud mod compliments the trees mod. So in the video above, the Tornado is sandwiched between rushing trees below and drifting cloud layers above. 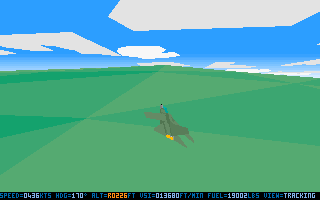 1993 flat-shaded polygon graphics at its best enjoyed with additional tree and cloud polygons on your 2018 computer. Enjoy! BTW, to see the difference this cloud mod makes, compare with my other video recording below, that shows a lack of cloud formations in the stock Tornado. Anyway, do enjoy the scenery and nature of the Cloud Mod on your modern computer of 2018. I used a custom-made Excel file to randomly generate the hex values that populate both files. Hint: 000h means all bits are zeros, so no chance of a cloud occuring in that sector. The more 000h values the emptier the sky is. My spreadsheet generated values from 000h to 01Ch (i.e., decimal 0 to decimal 28). Mod: Cloud binary mod. 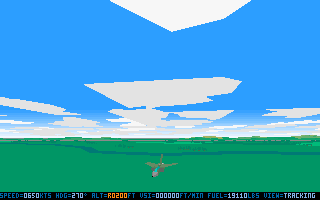 More clouds in the sky is incorporated into the full GUI-based game. making the cloud mods of hacks #46 and #45 useless when playing Tornado from the menus. The missions of Map2 (Europe). By modifying the contents of CLOUD1.BIN and CLOUD2.BIN, we can increase the volume and number of clouds shown for each map. The contents of CLOUD1.BIN before modifying - 00s represent no clouds (binary zero). The contents of CLOUD1.BIN after modifying - less 00s this time, so more clouds are being represented. The sky before the binary mod. The sky after the binary mod - the sky is more crowded with clouds. Cloud binary files are attached below. Mod: Clear nasty Tree cluster (copse) binary mod. Description: All FLIGHT.EXEs of previous tree mods had a major flow. If you chose Mission 3 "IDS - Early Warning Radar Blackout" of Warzone 2, you would find a copse of trees lies smack in the middle of the Airfield2. You could fly past the tree cluster without any ill-effects, but visually this is disturbing and needs to be removed to preserve the integrity of the game's visuals. What are those trees doing in the middle of on the airfield? What happened to the airfield's maintenance? This is a no-no. This mod which is essentially a modified version of C:\TORNADO\TORNADO\AMP\MAP3\TREE3.BIN removes that offending tree cluster. I am Hexcited to be able to pinpoint the exact byte responsible for this mess! Specifically, MAP3-TREE3-BIN-LINE310-COL0a. See the yellow highlighted hex values? That's it. All clear for takeoff. Roger that. Note: I have tested this FLIGHT.EXE with all Warzone's (WZ1, WZ2 and WZ3) Airfields #1 through to #4. All 12 airfields are clear of trees (on the runaway, that is) and are good to go. 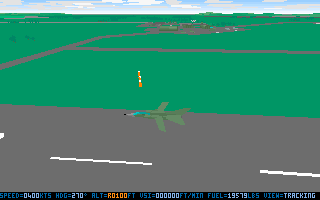 Conclusion: with this TREE3.BIN mod combined with the latest FLIGHT.EXE 3D engine, the game's airfields maintain their visual integrity, and the simulator's visuals have been enhanced. About 200% More trees rendered on the fly. No known glitches caused by more trees. More clouds. If you notice any anomaly, please let me know about it/them. Cheers. 49. Full-screen FLIR view now allows HUD to be toggled on/off. ...(NOW YOU DON'T!!). This results in a clear forward-looking full screen. The first time in its 25-year history that this is available in Tornado! Attached is the latest FLIGHT.EXE file, dated 9th April 2018, 1:00pm. BTW, his Thursday 12th April 2018, I hit the BIG Hawaii 5-0. Half century geezer. Semicentennial. Quinquagenary. Fifty years old. My avatar profile pic was taken in 2008. There I said it. So anyway, I am hoping to make it 50 Tornado mods in time for 12/4/2018. 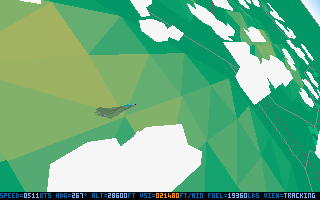 I wonder what else I can modify in the simulator. 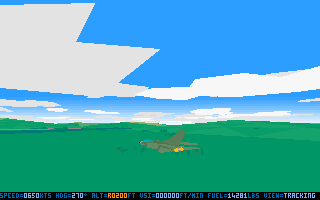 Description: Previously the user had to be in the Pilot's Panel view, and hit the "D" key three times to go to full-screen FLIR view. This hack is a shortcut that allows you to, from the Pilot's Panel view, go direct to the full-screen FLIR view by hitting Shift+d key combo. So no more hitting the d key multiple times to toggle the full-screen FLIR view. One key combo does it. The code that makes it work. The next (after hitting Shift+d, you're in the full-screen FLIR view! Description: This is an improvement over Mod#6 "10th Oct 2017 - Tracking View made more realistic and immersive with responsive horizon". Alt+p ('P' for 'P'itch) toggles the responsive horizon on and off while in Tracking view or Check Six view. 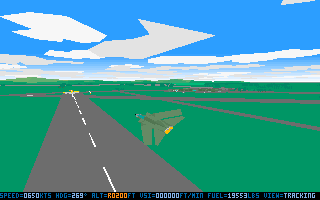 So now the gamer has a choice between the responsive horizon which pitches with respect to the plane's change in banking angle, and the horizon in the original stock FLIGHT.EXE which remains horizontal while the plane banks left or right. The reason for this mod is that there are many screenshots of Tornado in action which look better with a stable, horizontal horizon. Also, now, the user is the initiator of the responsive horizon - it's all about giving the user more choice. The code responsible for the toggle while in Tracking View (F1). If a picture is worth a thousand words, how about a video illustrating this toggle choice effect? The code responsible for the toggle while in Check Six View (F2). The toggle also takes effect in the Check Six view (F2 key)! My conclusion of the matter is that BOTH types of horizons have their place and BOTH look great. The latest FLIGHT.EXE is attached to this post. Note: I have also improved the "P"(ause) key. This time the P key is less 'bouncy' and more 'sticky'. Quite a number of interesting view effects are now possible for the Tracking View (F1). For example, hit F1. Then hold down both F1 and Z key (rotate left) simultaneously. Or hold down both F1 and X key (rotate right) simultaneously. Get the idea? 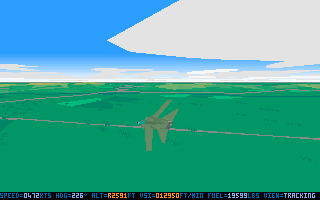 Description: In the stock Tornado by Digital Integration, the horizon was static. You could not shift it up or down. Until NOW - you can press and hold the "1" and "0" keys to move the horizon up and down in the Tracking View. 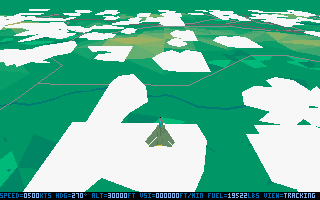 One of the best elements of Tornado is the simulation of the Terrain Following Radar and terrain hugging flight. A Tornado skimming the earth with trees whizzing by and clouds slowly billowing past in the distance is a joy to watch. This mod ups the ante by allowing you to raise or lower the horizon, and it displays everything else in perspective to the changed horizon. 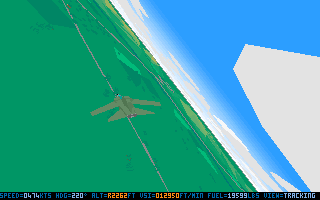 Now, in 2018, you have the the opportunity to create some stunning Tornado vistas and screenshots, not possible with the stock game of 1993/1994! More sky, less earth effects and example#1. This is useful for ADV missions where most of the action takes place in the sky. ...and press "0" and hold to raise the horizon and to see more of the earth! Press and hold "0" to shift the horizon down. More ground action is shown in this example. Screen shows DOSBox's Speedlock default key being re-assigned to F12 with mod3 activated. This will put a stop to the jarring noise heard when F12 is pressed during the game! Here's a video I made that shows you this effect. These are the visual effects now possible. Combine "1", "0" of this mod, with F1 and F12 from mod #52 and see what you get! You can even combine Combine the keys of "1", "0" of this mod, with F1 and F12, AND with "Z" and "X" for some creative panning. Have fun and be creative when trying this one out! P.S., see the latest FLIGHT.EXE attached. Description: I always thought that in Tornado, the explosions of ordnance could be improved. For one, during the impact of a bomb, the view would switch from Weapons View to Overhead View, with a visual of an explosion and crater. 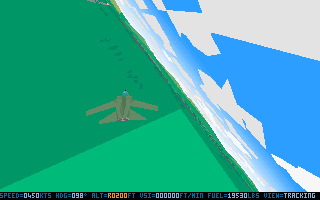 These visuals would be accompanied by zero vibrations and zero shuddering - stock Tornado does not model shaking of the screen for external views. In stock Tornado, only the Pilot Panel and Navigator Panel views will shake or shudder due to explosions. These two categories of changes, IMHO, enhance and enrich the Tornado experience. Here's an example of "Impact point new perspective and responsive (shake) views" in action. an innovative view of the pre and post explosions of an ordnance. 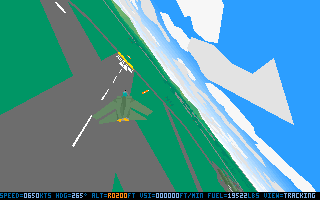 (1) The screen shakes on impact; (2) view can be panned left or right with the standard Z and X keys. Shake, Rattle and Roll with the JP233 ordnance and the flyby view! Made possible only in 2018. The crowd-favourite - a Laser-Guided bomb homing in onto its target.